While I was musing over the comments on last week’s post, I happened to flip through a book on birds, the environment and conservation*, and a chapter on some survivors caught my attention. The book’s title is clear, it’s about saving the birds, many species of which are threatened by rampant deforestation and are on the verge of extinction. However, there happen to be a few species that have adapted surprisingly well to the change in their environment and have flourished as human habitations and farmlands expanded over grasslands and forests. Are there any lessons businesses faced with a rapidly changing environment could learn from these hardy survivors ? Read on and let me know what you make of the examples that follow. Agricultural land is not a natural habitat, it exists at the expense of some natural habitat. Agricultural ecosystems differ from natural ones in several respects that are important to birds and other wildlife. In most cases the biggest yields are obtained by growing a single crop in large fields, dressed abundantly with chemical fertilisers and pesticides. Relatively few kinds of birds can thrive in these conditions; tree nesting species have nowhere to nest, and ground feeding and ground nesting birds are vulnerable to the heavy machinery used to plant, manage and harvest the crop. Not an easy environment for any bird species to thrive in, right ? But a few did. A common sight on the outskirts of most cities and in rural areas, often spotted on grassy patches within urban areas too. Cattle Egrets are exceptionally successful followers of pastoral man. The Cattle Egret’s success lies in its great adaptability. Where the birds used to follow the herds of grazing herbivores across the African savanna, they now adopt the same close relationship with man’s domestic cattle. Throughout their range they are associated with cattle, feeding on large insects and small vertebrates which the cattle disturb as they move through the grass. The birds divide their time between sitting on the backs of cattle and foraging around their feet. In Africa they can still be seen accompanying herds of wild game as they must have done before people began to replace the game with cattle. The African Cattle Egret is just as much at home with the cattle of the Masai and other pastoral tribes as with the migratory herds of Wildebeest, Eland and other animals which are gradually being squeezed out of grasslands and bush as pastoralists or farmers take over the land. 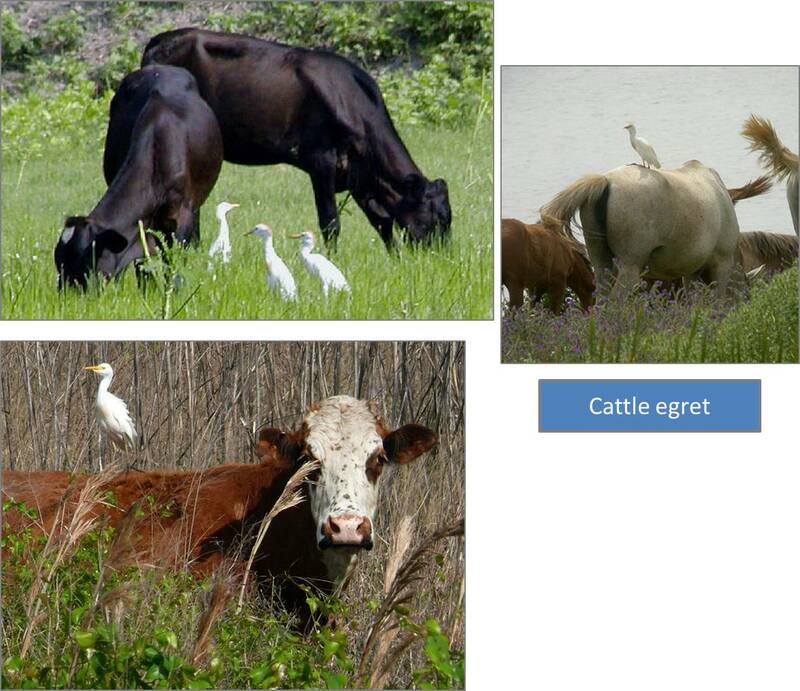 Indeed, the egrets are probably better off with cattle than with antelopes, for cattle do not migrate the huge distances that wild game do, and never stray far from water. They are useful rather than a hindrance to herdsmen and so have little to fear from man. They take insects that graze the same grass his cattle eat, fertilise the ground with their droppings, and even give warning of approaching predators. Cattle Egrets have occupied a new niche, created by man, and have even colonized regions where their natural niche does not exist. 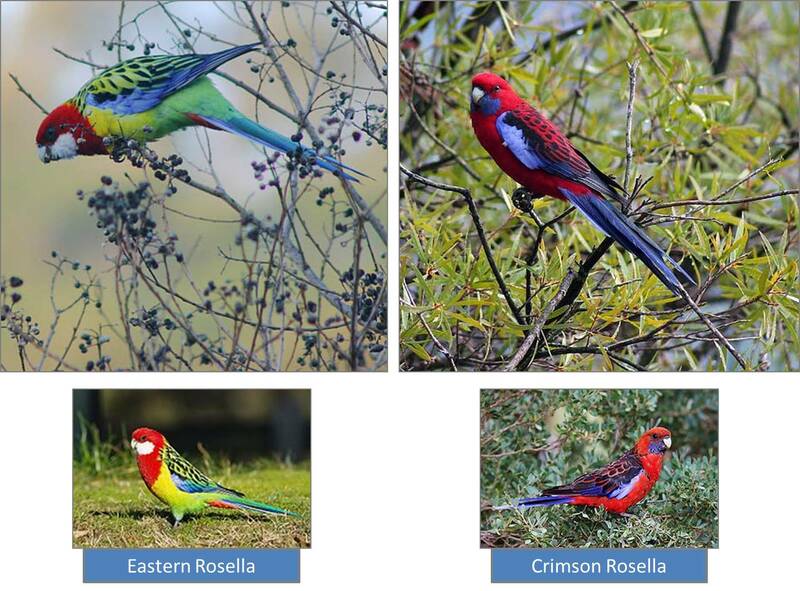 The eight species of Rosella are all brilliantly coloured, long-tailed Australian parrots. Several of them have adapted so well to agricultural land that they are sometimes treated as pests, at least in parts of their range. The natural habitat of the brightly coloured Eastern Rosellas (Platycercus eximius) is open woodland and lightly wooded grassland, and this has enabled the bird to adapt readily to the farmlands and gardens of human settlement. They spend much of their time on the ground, eating grass-seed. They are versatile feeders and have no difficulty in adding a wide range of agricultural produce to an already varied diet. They feed not only on fallen grass-seed, but also on spilled grain in farmyards and fields, and seeding grasses in pastures, but also on seeds and blossoms on the tops of trees. They seem generally to take grain that has already been spilled, and thus lost to the farmer, and probably do little actual damage except on the occasion when they take orchard blossom. They find the blossoms of fruit trees at least as attractive as those of native species, and can do considerable damage in orchards. Until the end of the last century, Collared Doves were found in southern and central Asia, east to Japan and west as far as Turkey. They were found mostly in dry or lightly wooded country, usually close to human settlements and cultivation. Then they began to spread northwest through Europe, reaching Britian in 1952. They first bred there three years later and by 1969 had swept through the country to become common birds of garden and farmland. In the following decade their British population increased fourfold. This astonishing expansion has few parallels, except the Cattle Egret and a few other birds. Collared Doves feed mostly on small seeds on the ground, and in Europe today they are virtually parasitic on man, taking grain spilled in farmyards or put out for poultry. They also compete with other birds – house sparrow, starlings, domestic pigeons – for breadcrumbs at garden bird tables and at parks. A useful point about the expansion of Collared Doves to Europe is to note what all they achieved with the change : They were newcomers to the local eco-system, they didn’t even exist in that geography before, yet they managed to find enough ecological space to establish themselves and enough surplus resources to survive and thrive. 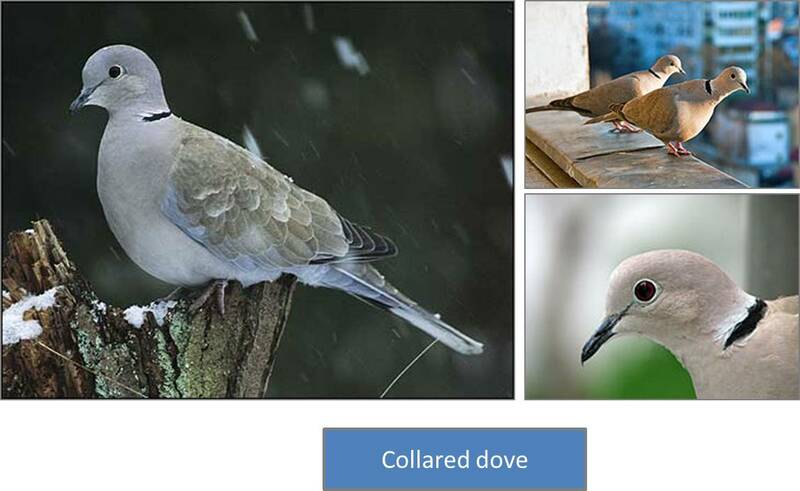 Probably the Collared Dove’s secret lies in its versatility, and the fact that although its requirements do overlap with those of several other species, it does not overlap completely with any of them. *‘Save the Birds’ by Antony W. Diamond, Rudolf L. Schreiber, Walter Cronkite and Roger Tory Peterson). ** The writer of this post acknowledges the urgency for conservation and environmental protection measures; this post is by no means intended to convey that the species that are struggling for survival or are extinct are responsible for their situation, neither is it intended to lighten our responsibility towards saving those feathered friends that are still around. Entry filed under: change, Environment, Observations. Tags: adaptability, birds, change, coping with change, environment.